The Jewish Press (link) recently published an essay by Christopher Buckley, son of the late conservative thinker William F. Buckley, on his visit to Auschwitz. The essay was written in 2001 but not published until now, when the author admirably went public in response to Bishop Richard Williamson's brazen Holocaust denial (no one was gassed in Auschwitz, yeah right). I must have read literally hundreds of such accounts, but every time the story feels fresh. Most of these pieces are written by and from the point of view of survivors, sometimes their childen or grandchildren. I remember hearing Lt. Col. Walter Fellenz, a non-Jew, tell of his experiences liberating a camp. And every time I ask myself what every Israeli boy (I was born and raised here in the U.S.A.) who lived through the Eichmann trial asked his parents: How could you possibly let this happen? Why in heaven's name didn't you fight? I heard all the answers. Nothing like the Holocaust had ever happened in human history and people didn't believe what they were hearing. They were so isolated that they simply didn't know until it was too late, especially with the Germans being careful to disguise the reality. They thought they were going to take a shower until the doors shut. They were systematically starved and decimated by disease, so that they were physically incapable of resistance. They remembered the Germans of World War I as fairly decent people who brought civilization and actually liberated them from Eastern European anti-Semites. This wasn't the first time Jews were persecuted; the madness will end like the Cossack massacres and the Crusades did. The Jews who did put up a fight did so with superhuman valor; the Warsaw ghetto held out in 1943 longer than all of Poland did in 1939. Above all, 2000 years of exile sapped our will to fight or, to paraphrase Nietzsche, turned our men into women. I've heard it all and nothing satisfies. And so, reading about it for the umpteenth time, but this time written by a Gentile named Buckley, I asked myself again: Could the Nazis have murdered [Buckley uses the word murder, not exterminate; one exterminates cockroaches and rats] six million Irish? The question is tragically laughable. Irishmen would have torn the S.S. limb from limb. They don't call them the Fighting Irish for nothing. So I finished reading and I cried. Then I went downstairs and lifted weights. Any wonder then that when people talk of the magnificent Torah life of pre-war Eastern Europe, I am filled with unrelieved disgust. I have absolutely no desire to resurrect a culture and a way of life that perished - literally went up in smoke - because we were too weak to defend it. Give me the Torah of Tanakh, the Torah of Joshua, Samson, King David and the rest (ever noticed how Tanakh is played down in the haredi yeshiva world? ), normal Jews living normal lives in a normal country. Or give me nothing at all. The danger of such an approach is the it comes perilously close to blaming the victims. I agree this sounds like blaming the victims. However, we can learn from what happened and make sure Jewish youth are physically strong and know how to fight when necessary. This whole sit and learn and not serving in the IDF and sports and athletics are bad or not tznuius have no basis in Tanach to my knowledge. I remember reading the article, and it was powerful and sad. I disagree with your conclusions, though. Consider, what would you do if the US government started rounding up Jews. Do you have a tank parked in your garage? Do your neighbors? Would you know where to get millitary grade weapons, or how to use them if you did? The German army was one of the best in the world. They defeated France, a superpower at the time, in weeks. They held off the British Empire, the Soviet Union, and the United States for years, and had things gone just a little diffrently the Germans would have won. So what, exactly, were the Jews at the time supposed to do? Even the Warsaw Ghetto uprising, the pinnacle of Jewish resistance, was a fight against occupation troops, second-rate soldiers. It ended when the commander of the Warsaw garrison got a squadron of Stukas to reduce it to rubble. Unfortunatly, the fighters in the ghetto lacked anti-aircraft guns. I don't mean to rant, but there really was nothing that most of these people could have done. 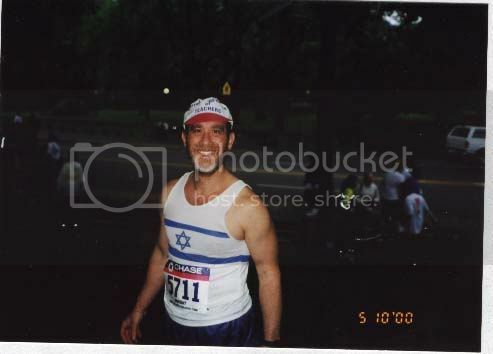 Here is a wonderful example of a Jewish man, age 70+, who lifts weights, competes as an Israeli weightlifter, and will continue for the rest of his life. Any anti-semite coming after him with ill intent (including muslims) would find himself on the floor before he knew what happened. Hitler ym"sh didn't get here from Mars, leave his spaceship and murder six million Jews (and millions of others) all by himself. There were beer hall putsches and low-level harassment by brownshirted street bullies before they took over state power. My father a"h was an amateur boxer in Vienna and used to take on the bullies with his fists. We could have used a few more like him. Once the Nazis assumed state power, then it was too late to influence the final outcome. The ghetto fighters and partisans knew this. The objective was to not make it easy for the enemy. Let them know they'd been in a fight, even if they win. Let them lick their wounds after the battle and not celebrate in beer halls. A gun is not magic; it's a piece of machinery that requires a steady hand, decent eye-hand coordination and calm nerves; that's why Olympic marksmen often dope with beta-blockers. It's hard to keep a steady hand and calm nerves when you're being attacked by ten strong men from all directions at once. Many of the weapons used by the ghetto fighters were grabbed from the Germans. I am not blaming individuals, but a revolting cultural mindset cloaked in the hopelessly distorted Torah of galut. The curses in behukotai and ki tavo predict what occurred: We would be soft-hearted and cowardly in the lands of our enemies, we would be unwilling to stand up to them, we would be the world's laughingstock, etc. But these were curses, not mitzvot. Women were cursed, not commanded, to suffer in childbirth, and they may and should do anything in their power, consistent with their own well-being and that of their babies, to minimize their suffering. Same here. One more thing. Every comment here was anonymous. Why? It comes to the same question: Where is our courage? Why won't you put your name, or at least a pseudonym, on what you write? My name is at the top of my blog, and anybody with a modicum of research skills can find out where I live. I have yet to come to any harm from anything on my blog. Nor have I had to lift my hand against another Jew - a tragedy for anyone who tries to follow the teachings of Rav Kook - or, for that matter, against anybody else. Anonymity is the bane of rational discussion, on the internet or elsewhere. It shields writers from taking responsibility for what they write. There are no anonymi on the Declaration of Independence. Everybody signed his name, pledging to one another their lives, their fortunes and their sacred honor, knowing full well that if their enterprise failed they would all swing from a British gallows. And with that courage, their enterprise succeeded. So iy"h will ours. I notice in the above you state you must have read literally hundreds of such accounts (gassing in Auschwitz) but despite considerable research I am yet to find one actual eyewitness account. When I examined all these that claim to have been a part of the process, they go on to account for things they would not have been able to see or are now accepted as factually incorrect rending their accounts unreliable which is becoming rather frustrating. Can you point me in the right direction please with some names etc..
Is this our idea of beauty?